There are many reasons you may want to create your own audiobook: Perhaps you are the author of your own book and want a version of your book spoken in your own words. You can even create an audio only version of a favorite family story spoken by the person that lived through the event and pass it down from one generation to the next. For me it was a chance to capture my children’s voices while reading their favorite stories and nursery rhymes (for personal use, not for reselling of course). Now when they grow up, they can play them back to their own children. Whatever your motivation, creating your own audiobook isn’t that difficult. The following will walk you through the steps necessary to record the spoken word, capture it in digital audio, and convert it into the audiobook format. Finding an acoustically sound location to record your reading sessions is probably the single most important decision you will have to make in this process. Annoying ambient noise, room echoes and outdoor wind can make for a poor recording. Provided you do not have your own private recording studio, a large closet packed full of clothes will prove to be your best bet. The material in the clothes will absorb most of the unwanted background noises as you record. Choosing a decent microphone that can produce the sound results you are looking for is the second most important decision you will make. Considering the fact that you will be retreating to your closet to do most of your recording sessions, choosing one that works well with your portable iOS devices is recommended. The Apogee MiC ($199.95, Accessory) works extremely well with both the iPad and the Mac, and has a really great sound to it. Using any external microphone is preferred over the onboard mic that comes with the iPad. 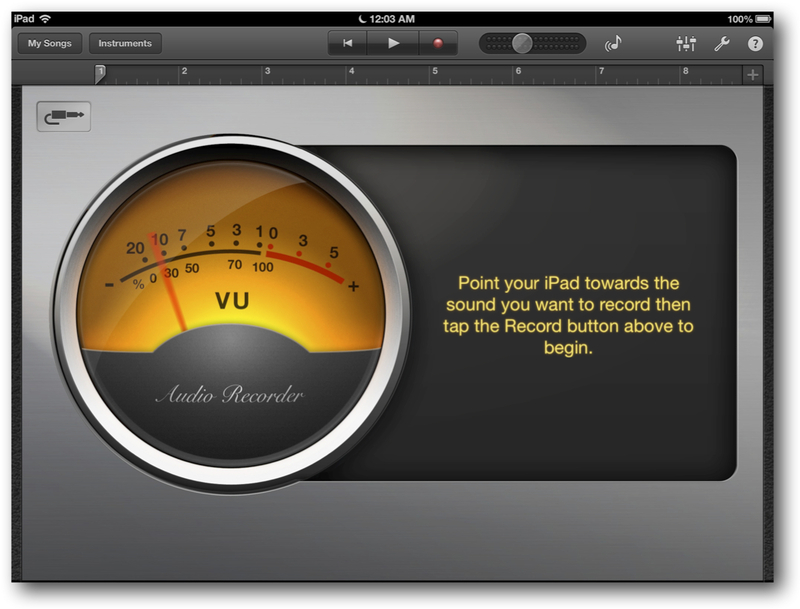 To record your voice Apogee recommends using Apple’s own GarageBand for iOS ($4.99, Universal). 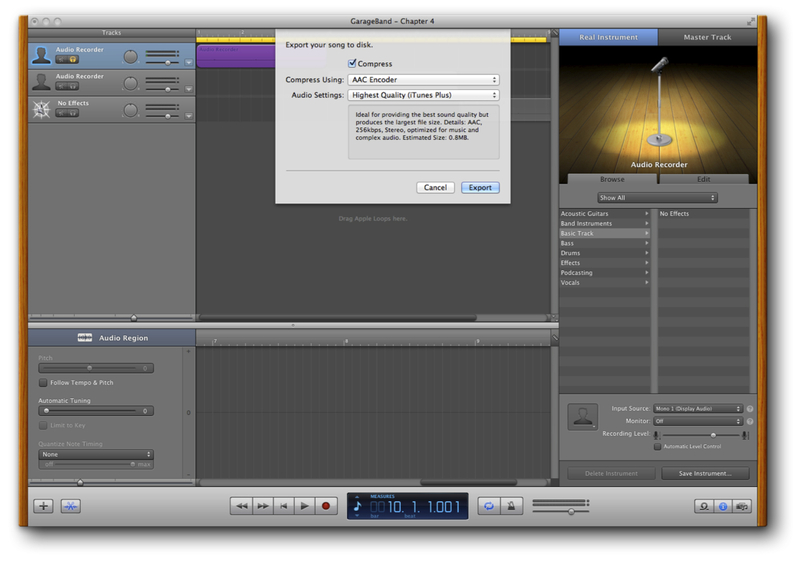 When you first create a project in GarageBand, be sure to select Audio Recording as your instrument. GarageBand can also be configured to record in the background, which comes in handy when you are reading a book from your iBooks library. As things progress and you continue to read your book you will want to offload your recorded sessions as GarageBand project files organized for each individual chapter. Follow a naming convention that makes sense to you from the start so you don’t get your recorded sessions out of order. To offload your recording from GarageBand on the iPad, you tap on the recording you want to save and then choose to share the file to your iTunes Library on your Mac. Once the process is complete, you then must tether your iPad to your Mac and open iTunes on your Mac. Select your iPad and navigate to the Apps tab. 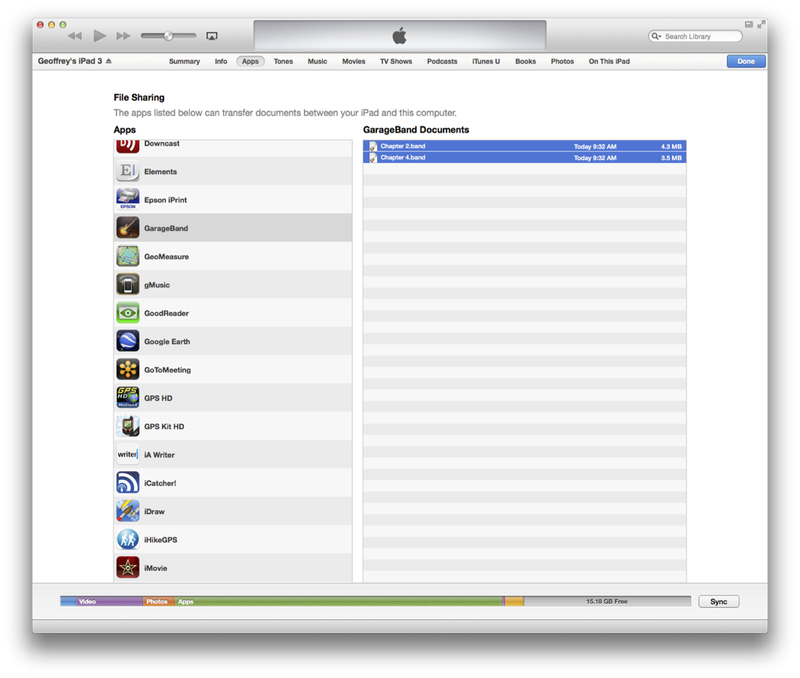 By selecting GarageBand in the File Sharing section, you should see the individual recordings you shared. Simply save them to your music folder on your Mac. When you are recording, you may have extended sessions of brilliance. But not every session will be so great. 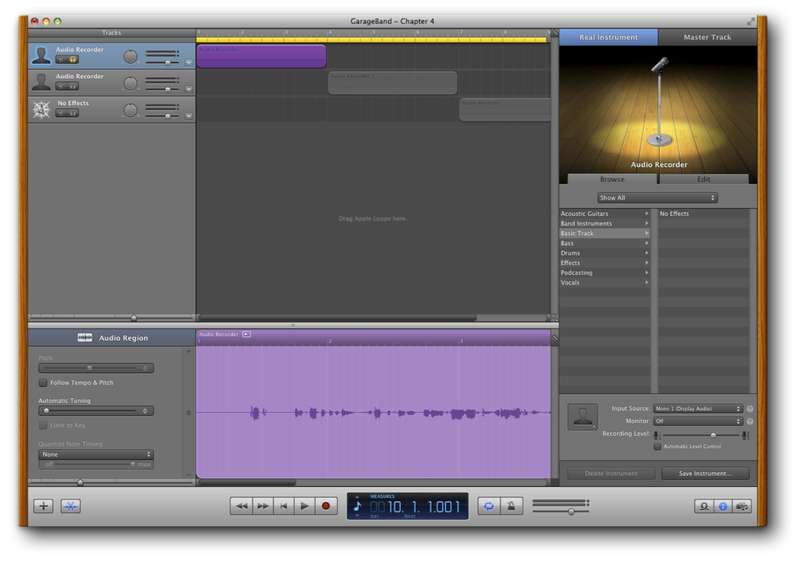 Cutting and splicing your recordings together can best be accomplished with GarageBand ($14.99, Mac) on your Mac. In GarageBand you can cut and splice your recorded sessions to remove any unwanted audio. So you don’t have to worry too much about being interrupted or flubbing a sentence or two when you are making your original recording. You can always cut it out later. GarageBand is a great tool when it comes to editing multiple tracks, one song at a time, or in this case one chapter at a time. But it is not so great when it comes to organizing multiple songs into an album, or in this case multiple chapters into a book. Each GarageBand project should be thought of as an individual song. 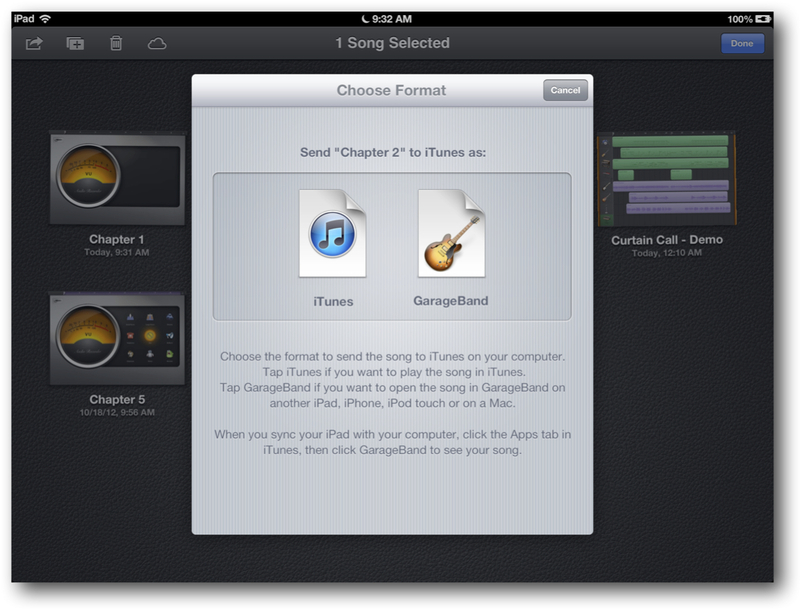 This means that each book will need to have multiple GarageBand projects, one for each chapter. Once a chapter is complete, you need to click Export Song To Disk, which is located under the Share menu item. Repeating this process for each recorded chapter will produce a series of audio files, one file for each chapter. Audiobook Binder (Free, Mac), available in the Mac App Store, can be used to combine all of your individual chapters into a single audiobook. 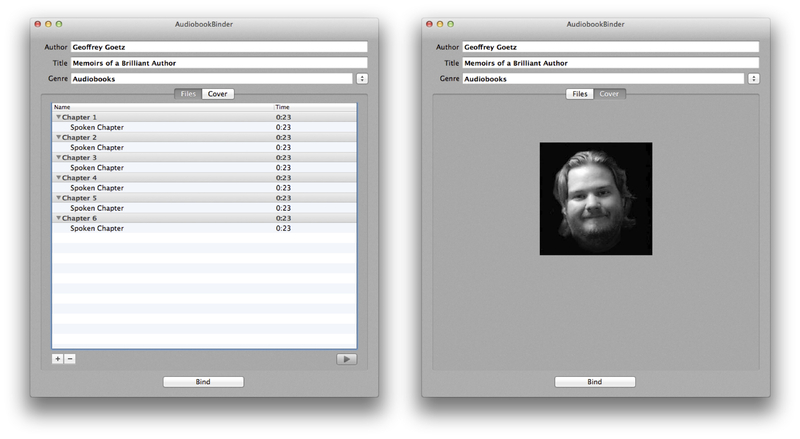 Simply drag and drop the audio files into Audiobook Binder in the proper order. Once in Audiobook Binder, you can change the chapter titles to be whatever you want them to be. If you happen to have multiple audio files that comprise a single chapter, you can even combine them at this point. Be sure to edit the author information, book title and add your own cover artwork. Once everything is set, you simply click on the Bind button to produce the audiobook music file. And there you have it, you have just learned that GarageBand may have an equally promising future being known as ClosetNararator. Try a practice run through the steps and actually listen to your first chapter before moving forward. Finding the ideal location and microphone for your needs will prove to be the most difficult aspect of this endeavor. When doing recordings, it pays to invest as much as you can afford in the initial recording, rather than try to fix things later. There is nothing more annoying than to listen to a constant hum when you are trying to hear someone speak.